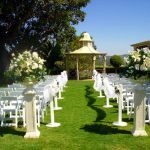 White Americana chairs, bollards with white organza fabric draped down the aisle and small silk flower urns and pedestals. 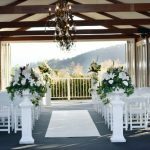 White Americana chairs; off-white carpet; set of small silk flower urns and pedestals; set of large and small modern silk flower pedestal arrangements; and hanging white pots with silk flowers. 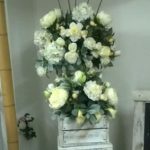 Price on request – Hired Items – Email us for pricing. 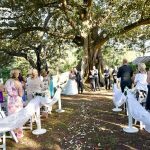 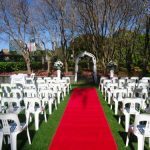 Ceremony setup in Roma street Parkland with our white pavillion arbour, crystal chandelier, white modern pedestals and fresh flowers, white carpet, white folding chairs. 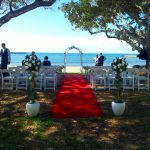 Please contact us for more details on the package price. 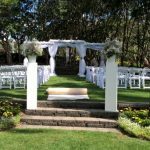 Americana chairs; 10m red carpet; white rose topiary trees; decorated white wrought iron archway; and hanging pots with silk flowers. 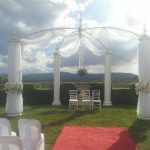 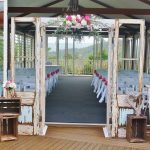 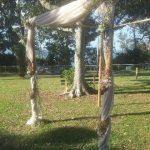 A simple, yet stylish outdoor ceremony set up with white Pipi chairs, 10m red carpet, decorated archway, small silk flower urns and pedestals, and a decorated registry table. 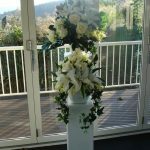 Ceremony set up featuring white bollards draped with white organza fabric and finished silk flowers. 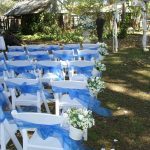 This look completed with a fresh petal aisle and white Americana chairs.